Wait just a darn minute: Baseball fans remember June 9, 1999, when then-Mets manager Bobby Valentine got kicked out of a game only to don a disguise and return to the dugout minutes later. But few seem to recall the bizarre event that occurred six years later, on June 17, 2005, when Mets manager Willie Randolph pulled an even more outrageous stunt. New York was getting hammered by Philadelphia 12-2. Rather than call on his bullpen, which had been exhausted in an extra-innings game the night before, Randolph in the seventh inning sent starter Al Leiter back out to the mound along with a pitching machine and a carton of balls. It took a few minutes before umpire Ted Barrett, who also was tired from the previous night's marathon contest, realized what was going on, allowing the machine to post a line of two hits, an earned run and a hit batsman in a third of an inning. 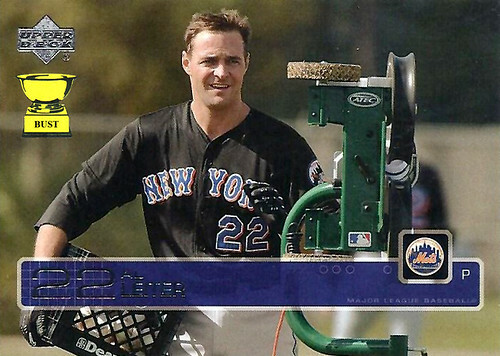 The Mets signed the machine to a one-year extension the next day.